The dark streak in the Skywalkers is undeniable. You can't escape your blood. He is his uncle's nephew. Kylo really is a dark version of Luke - one that gave into his father's offer and succumbed to the dark side. Fascinating that love for Anakin can be a redemptive force and a destructive force. His legacy still casts a strong shadow in this saga. @vaderito I thought about them when I saw that scene. out minds are connected !!! @vaderito I thought about them when I saw that scene. our minds are connected !!! It's Snoke who did it! In TFA, Kylo is very much a Knight, which is reflected in his costume design and in keeping with the medieval fantasy/fairytale vibe. In TLJ, Kylo is like a Prince, which is again reflected in his costume design. In IX, Kylo is now Supreme Leader of the FO and in charge of an entire galaxy. He is very much taking on a kingly position. I imagine it will again be reflected in his costume too. I'm excited to see what Michael Kaplan will come up with. Not sure why I've had an explosion of TLJ feelings in the last few weeks, but it just occurred to me that maybe the ugliest aspect of audience reaction is the perception that Rian is an inconsiderate jerk. Like he just disregarded the last movie, the next movie, the entire concept of consistency in the trilogy. When in reality he's really been so sweet and collected, never mad, never getting defensive, never attacking anyone or complaining or acting like a victim, spending hours at events interacting with fans. I was not paying attention two years ago, but I get the impression Rian has an unusual level of contact with fans. What was JJ like at that time? I get the impression he did not do many interviews and does not have social media. I'd be a little salty if I was him! @californiagirl wrote: Not sure why I've had an explosion of TLJ feelings in the last few weeks, but it jist occurred to me that maybe the ugliest aspect of audience reaction is the perception that Rian is an inconsiderate jerk. Like he just disregarded the last movie, the next movie, the entire concept of consistency in the trilogy. When in reality he's really been so sweet and collected, never mad, never getting defensive, never attacking anyone or complaining or acting like a victim, spending hours at events interacting with fans. Nah, JJ isn't as giving as Rian. He's notorious for his mystery box and he took it to another level with TFA. Which is ironic as MakingStarWars leaked the whole plot about a year beforehand. The only time Rey and Kylo were even shown together in TFA marketing was the international Japanese trailer. Rian is definitely an anomaly amongst directors in terms of fan interaction and giving us all these tidbits. JJ may be more open regarding IX as we know the characters and the story now so it's a slightly different situation. And @MyOnlyHope is completely correct, JJ quotes are rare so every one we get is a goldmine and his directors commentary was especially great for this. Don't expect anywhere near the same level of fan interaction with him, he's a lot more traditional Hollywood. We've been very, very lucky with Rian in this regard, especially with how vulnerable he's made himself to the backlash by staying on social media. JJ does have a twitter account btw, he created it recently but it's locked. There was a link on the forum to "the Director and the Jedi" documentary. Could someone help me to locate it? @Darth_marshmallow wrote: There was a link on the forum to "the Director and the Jedi" documentary. Could someone help me to locate it? I noticed 2 strange things about flashbacks. In 2nd version (Kylo) and in 3d version there is odd sound when the lightsaber flys to Kylo. Don't laugh, but to me it sounds like Wookie language. And in the end of 3nd, when hut collapse, you can hear very short and very loud scream - maybe a child, maybe a woman. This is not Luke's or Kylo's scream. Also, the last version is the only version when Kylo's theme plays in the end. Also, the last time Ben and Luke see each other, Ben blows up the hut. 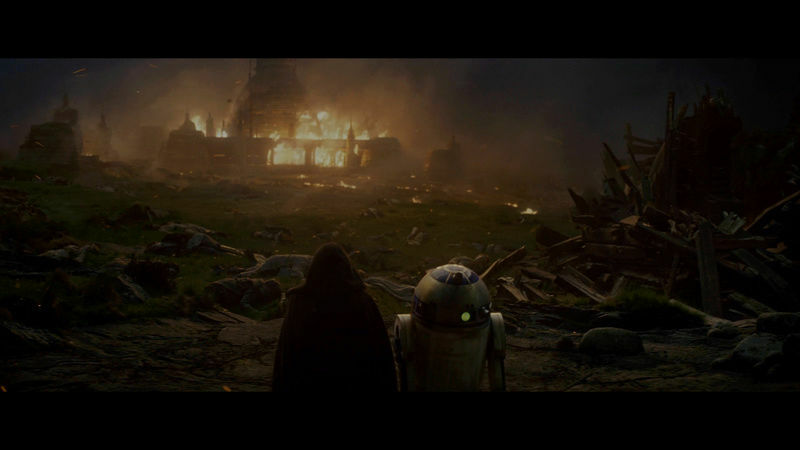 The first time Kylo and Luke see each other, Luke blows up the hut. On top of all these echoing moments Kylo took the steps George Lucas almost considered for Luke. At one point Lucas really contemplated turning Luke to the dark side after Vader died. The last scene of ROTJ could have been Luke taking his father's helmet, putting it on and saying "now I am the emperor and I will destroy the Rebel Alliance." So instead of it happening in Episode VI that ending got transplanted to Episode VIII. I noticed them, and thought it seemed like a lot of bodies (unless some of what I think are bodies are just rubble). Luke took "a dozen students," right? And Kylo ran off with a "handful" (who we suspect became the KoR) and killed the rest. So, 13 students (Kylo + a dozen) - 7 (Kylo and 6 KoR) should equal 6 dead students. It feels like there are more in the picture than that but it's pretty hard to determine what's definitely a body. Wow, I never noticed them at cinema. But now I count 6 corpses, all left of Luke, in the lower half of this pic. And two of them are quite clear to see. Once seen neer unseen. Assuming the numbers are correct and six were killed and six went with Ben, what if the six that were killed were the actual plants/spies of Snoke? It makes plausible sense when you think about it: Ben wakes up and sees Luke standing over him in all his murderous glory (from Ben's PoV), he collapses the roof and leaves Luke under the rubble. Next thing he knows the six "fake" padawans are revealing themselves, and the six other legit students have no idea what's happening. It's a total gong show and all Ben knows is that Luke tried to murder him and now half the other students seem to be corrupted. So he kills them and makes off with the other six students (who aren't actually the Knights of Ren, they're just normal kids). What if Ben left with them to either hide them or return them to their families? That would be quite the twist. And then the Knights of Ren have really just been with Snoke this whole time and they're just a whole other thing (ie. they weren't at Luke's Jedi Camp). We'd have inverse Anakin with that scenario, again. Really fun but, how come it is so difficult to get stuff of Adam x Daisy together laughing and talking? [Rey]After being called by Luke's lightsaber is called by the Jedi texts, called by a big wet hole and called by her greatest frenemy." But forget about the b**hurt fanbous who are just mad the movie isn't closer to the one they wrote in their heads. Kylo Ren is back and he demands a full reboot ["Let the past die" xD] when he doesn't look like he is about to cry, which is ALWAYS. Watch as he ditches the Vader, fanboy act, the mightly duck mask and... his shirt. He's just such a good sport. I think it will die down to an extent pretty soon. @californiagirl IMO, TLJ will easily be deemed the 2nd best SW movie after TESB by the fan base in less than five years. Just some time and perspective is in order. TLJ on Blu-Ray; see dead students in HD! One of the things from that article is how he was able to deal with the scrutiny from fans and the press in a way that's gracious, albeit yikes at the jerks and outright crazies. But that's part of why he got handed another trilogy, he represents LF well. Didn't get that same sense from Trevorrow's interviews (where there's the extra scrutiny of getting in the position he was in thanks to making friends with the right people), he comes off as somewhat prickly/defensive. It's hard to imagine him being able to handle the same situations as diplomatically. So on another topic, I was thinking about the list of film influences Rian had mentioned in the old Empire podcast after they announced he was hired. The cinematography influences from those films are clear and Holdo's arc is pretty obviously meant to be 12 O'Clock High. But what I was thinking about for the Force plot was Three Outlaw Samurai, which we'd speculated about about, because one of its central themes is about shifting loyalties and alliances between the characters. 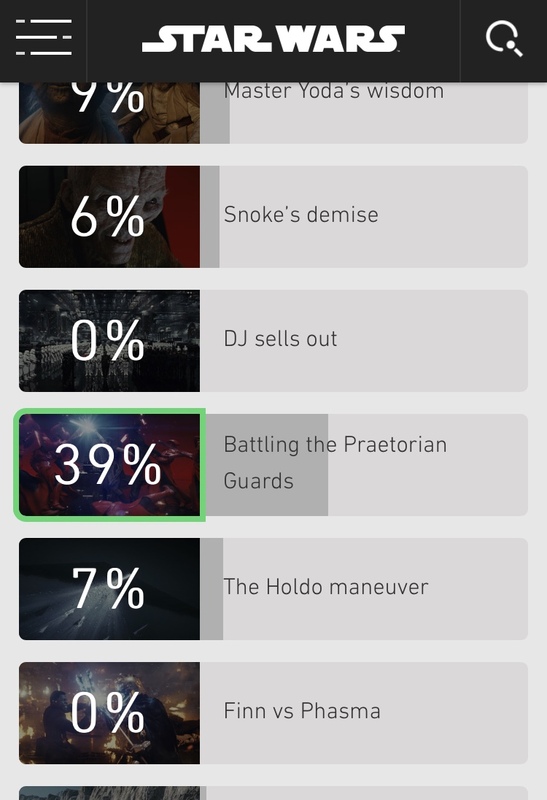 So post TLJ score card on those themes, I guess we saw Luke unintentionally betray his family with what happened with Ben, Ben big time betrays his family by destroying Luke's temple, allying with Snoke/the FO, and murdering Han, and then betrays Snoke by allying with Rey, murdering Snoke, and then betrays Rey by deciding to go for the throne. And Rey ends up betraying the Resistance by getting involved with Ben, taking his side against Luke, not bringing Luke back to the Resistance (good thing he had that Force projection trick), and helping Ben take out Snoke and becoming Supreme Leader. And 'complicated enemies' sure do see things differently now. On the Resistance side, DJ's more clear-cut of shifting his loyalties based on how it can benefit him and Poe at least with trying to undercut Holdo (though he comes to heel by the end).